Pebble Mill Studios were the base of the BBC in the English Midlands located in Edgbaston, a suburb of Birmingham, England. The views from the roof overlooked Cannon Hill Park, a nature centre, as well as Birmingham’s city centre. Pebble Mill became a prominent landmark in the Edgbaston area and contained offices, television studios, radio studios, two canteens, a post office and a garden. The production location credit was attached to programmes like Pebble Mill at One, The Archers, Top Gear and Gardeners’ World as well as many radio and television dramas. During the 1950s and early 1960s the BBC Midland Region was based in offices in a regency manor on Carpenter Road, Edgbaston and a pair of small studios in the city centre. The news studio was located in a building in Broad Street (thought to be on the site of the current Hyatt Hotel opposite the ICC). This small studio remained in operation until 1971. The BBC Midlands has always been famed for its dramas, with drama productions taking place in a former cinema in Gosta Green (now the site of Aston University BioEnergy Centre). However, by the late 1960s these studios became too small for the expanding region and were hampered by being spread out across Birmingham. It was during the 1950s that the BBC started designing and constructing Television Centre and sections of senior BBC management in London decided that Scotland, Wales and the English Regions should have ‘National Production Centres’, to produce more effective television and radio for the areas which they covered. The lease for the site was acquired from the Calthorpe Estate on a peppercorn rent by the BBC, but plans for the site were not approved until 1967, the same year that construction of the studios began. The centre was designed by John Madin founder of the John Madin Design Group, who also designed other Birmingham and Midlands buildings including Birmingham Central Library, Redditch Library and the Birmingham Post building. The nine acre site was opened by Princess Anne on 10 November 1971. The centre had a large central seven storey office block. At the rear was the staff car park and OB (Outside Broadcasting) base; the audience entrance was to the front and centre of the complex. The main production complex was split into two sections, a TV section (to the right as seen from the road) and a Radio/Sound section (to the left as seen from the road). 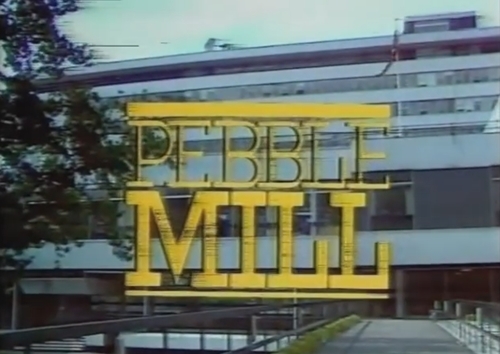 Pebble Mill was designed to be an addition to London’s Television Centre as part of a change in corporation policy in making network programmes in the English Regions and National Centres consisting of Manchester, Bristol, Cardiff, Glasgow and Belfast. The original plan was to contain a Light Entertainment Studio (A) a regional news studio (B) and a drama studio (C) which was to be similar in size to TC6. Studio A was the main television studio which opened in 1971 and was 6,500 square feet (600 m2) (81 ft × 80 ft within fire lanes) in size. It opened with three separate control rooms with windows looking onto the studio floor: a production gallery, to its left a combined Vision/Lighting gallery and to the right a sound control gallery. The studio had four EMI 2001 cameras, a fifth back-up camera and a Thorn Q-file lighting desk, all of which were replaced in 1983 with five Link 125 cameras and a single Ikegami HL-79D camera with a GVG (Grass Valley Group) 1600-7F vision mixer and later a Rank Strand Galaxy lighting desk. In the early 1990s, Pebble Mill’s Technical Resources Department decided that, following London, Manchester and Cardiff’s change to CCD cameras and also at the urging of producer John King, an upgrade from the old Link 125 tube cameras was needed. A working party was put together who toured the country’s major BBC, ITV and independent studios to see what was on offer. Finally the studios bought four Sony BVP-370 studio cameras and two BVP-70 portable cameras. In November 1997, work began on a major refurbishment of the studio. This included a new production control room complete with 36-channel Sony vision mixer and DME, new lighting/vision control room which also saw the return of technical equipment into the studio and not in a remote Technical Area. A re-equipped sound control room with new Calrec Q-series 60-channel desk. This £2.2 million upgrade took nine weeks and Studio A re-opened by the end of February 1998 as a fully digital widescreen facility complete with new six Sony BVP-500 and two BVP-550 cameras. One claim to fame for studio A is that it was the home of a new kind of floor paint. For many years all studio floors had been painted with water-based paint, with disastrous consequences if any liquid was spilled on it. Before a new colour or pattern could be applied, the floor had to be washed and dried with special machines. This wasted valuable time during studio turn-arounds. At Pebble Mill they developed ‘Pebble Mill Peelable’ paint, which did what it said on the can. This enabled the next floor to be painted on top of the old one, layer after layer, until it grew so thick that the cameras were bumping over the irregularities, at which time it was simply peeled off. Studio B was for local news and sport and was 40 × 25 ft in size. The studio was situated next to Studio A on the first floor and was close to the news room. Studio B had a combined control gallery with Lighting-Vision-Production and sound all sited next to each other. Studio B was used primarily used for Midlands Today but also produced Network East and other regional programmes. ‘B’ opened with EMI 2001 cameras and in the 1983 refit received four Link 125 cameras. Studio B also contained a small Presentation Studio for lunch time ‘Opt Outs’ and was equipped with a Link 125 and a COX Vision Mixer. During the late 1980s and early 1990s, Studio B was fitted with a GVG 200 vision mixer, Ikegami HL-55 cameras and a Calrec sound console. The presentation studio also gained a small gallery with a HL-55 camera and a GVG Master 21 Mixer. Later in the 1990s the studio cameras where replaced with Sony BVP-70s. The Pebble Mill studios were originally intended to have a third ‘drama’ studio – Studio C – next to Studio A but this was never built. The complex’s main foyer (62 × 44 ft wall to wall) became the third studio instead, as space was needed for a new daytime show Pebble Mill at One. The ‘Foyer’ had its original suspended ceiling removed and a simple scaffold lighting rig installed. Audience seating replaced the Italian marble reception desk and interview seating was installed next to the main windows. Pebble Mill at One was a Light Entertainment show with interviews, music and cookery very similar to the current “One Show”. Pebble Mill at One ended in 1986 but in 1988, Daytime Live was launched. Essentially the same as Pebble Mill at One, it used the same format and had basically the same content only started at a different time and therefore had a different name. In 1992, Good Morning with Anne and Nick (Anne Diamond and Nick Owen – who were previously seen together on TV-AM) replaced Daytime Live. Needing a bit more elbow room, it wasn’t long before the construction of a conservatory studio within the courtyard area was completed and was used for cooking items and interviews. The foyer at first used the control galleries of Studio A but in 1983 ‘Gallery C’ was commissioned. This was part of the ongoing refit of the complex which included all other studios and technical areas. Studio C’s gallery was situated on the first floor between the Comm’s centre / TAR (Technical Apparatus Room) and the Glazed Long Gallery at the front of the building and was the studio’s original continuity booth. The Studio C’s Production gallery was a two tier affair with a Monitor stack at the front. A lower ‘trench’ with a Rank Strand Duet 2 lighting desk later to be replaced by an Arri/ETC Imagine and vision control and colour matching for the four Link 125 and two Ikegami HL-79D cameras. On the upper tier sat the director, vision-mixer, PA and technical manager. 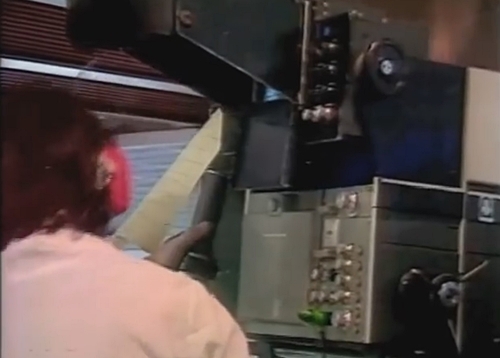 The vision-mixing desk was made by Grass Valley, and had a single mix-effects (ME) bank, which had only one keyer, and no ‘EMEM’ effects memory system: effects on the ME bank had to be set up manually each time they were needed. In the late-eighties there was also a single-channel EFLEX Digital Video Effects (DVE) device, operated by a second vision-mixer (person). This was replaced in the early nineties, with a dual-channel Abekas A51 DVE, capable of more sophisticated 3D digital video effects. Next door was the sound gallery with ‘L’ shaped console. This had a window looking onto the ‘Trench’ and to the outside world. Just out side of both control rooms was a small entrance vestibule which also contained a small voice-over booth. In the mid-1990s (when Good Morning with Anne and Nick started) Studio C was updated and gained a separate Lighting/Vision gallery in dead-space area within TAR and had a door knocked through into the trench. In keeping with the centre’s new policy four Sony BVP-360 and two BVP-70 cameras where installed. The studio also had a GVG 200 series vision mixer and a Calrec sound console. The daytime drama series Doctors was also made at Pebble Mill between 2000 and 2004. Despite the fact that there was a perfectly good television studio sitting empty, by then studio A had been closed, so the windows of the foyer (studio C) were blacked out and that became the studio – with all its limitations. Doctors also used an additional space – radio Studio 1. During the 1970s until the general refit in 1983 TAR was part of the technical rooms suite on the first floor adjoining Studio A. (This was to be the central technical link between Studio A and Studio C) This area housed the ‘Line Up’ desks for Studio A and B, as well as a maintenance area, the dimmer room for the studio production lighting systems and TV signal generation equipment. When the 1983 refit began it was decided that a Central area should be built combining both Studio A and B’s island desks and the new Studio C area. The new CAR/TAR was in the comms area which had shrunk due to new technology making switching even more compact. Around the late 1980s early 1990s Comms Centre moved again giving Services Department a new centralised service centre in the old vacant comms centre. The new services area contained work benches for all the disciplines (Comms, VT, camera, Vision and Lighting control), a camera test area and a small mechanical workshop (situated just above the north riser with Studio C directly below. Any work in the workshop had to stop during programmes as noise would travel straight into the foyer). At the rear of the OB base was a small studio space called BORIS. This space was used as a rehearsal room and for a brief period of time using Studio C’s gallery, was used for the early Sunday morning Farming programme which later on became Countryfile, presented by John Craven who had just stopped presenting Newsround and latterly as office space and storage. The Green Room was part of an extension into open space by the driveway to the rear car park. This new extension included workshop space for the TV lighting department, an extension to the Graphics Department, Production design and the Green Room for the Daytime Programmes produced at Pebble Mill. The centre was also home to the largest and most advanced BBC post-production departments outside London, including six VT edit suites, two dubbing suites, a small viewing screen and a multitude of Avid non-linear suites. Following the 1983 refit a vast Graphics centre was opened in the old site of TAR and contained Aston caption generators, Rank Cintel Slide Files, Quantel Paintbox and Harry’s and other graphic systems. The basement had most of the Dressing rooms and the Costume Department which produced hundreds of Period and Specialist drama costumes from the early 1970s until it closed in the late 1990s. Production Design had design offices in the central tower block until moving in the early 1990s to the new extension. Workshops where on the ground floor next to Studio A. Close by to the construction workshop where several props cages which contained all manner of items, even a Dalek. Make-up had a large purpose built complex on the ground floor next to Studio A. Throughout its life Pebble Mill formed part of the BBC’s communications and transmission backbone. Television Centre had primary responsibility for most of the BBC’s transmitted output and day to day transmission switching and presentation. Pebble Mill was the Midlands Central Switching and Monitoring Centre and would route national channels (2 television and 4 national radio as well as local radio) to the Midland transmitters at Sutton Coldfield, Ridge Hill and The Wrekin and to other parts of the UK as well as acting as a national back up to TVC in case of emergencies. In the late 1960s to the early 1990s Pebble Mill also had a fleet of ‘Links’ vehicles that were used to relay vision signals from OBs back to Comms Centre before being redistributed to London. All audio signals were sent via copper cable (Post Office/BT land Lines). When satellite transmission of picture signals started in the mid-1990s, Pebble Mill gained several satellite dishes on its roof and also had fibre optics installed as well as more permanent links to Birmingham’s BT tower. During the 1970s ‘Comms Centre’ was above the foyer but the 1990s Comms moved around the corner and was situated in the link area between Radio and TV. As the second centre to open following in the uk after sites in London, it was a natural to have outside broadcast vehicles in Birmingham. BBC Midlands had a modest fleet from the earliest era and consisted of both Radio/Sound and Black and White Television Mobile Control Rooms. These were based at the Carpenter Road, Broad Street and Gosta Green sites. With the completion of Pebble Mill the studios became home to a substantial OB (Outside Broadcast) fleet. In one of the original plans for Pebble Mill, a large Regional OB base with garaging for as many as 12 vehicles and workshops, maintainace facilities and ancillary services. The BBC decided that all its regions were to have a Colour Mobile Control Room and Pebble Mill received CMCR 6, a Type 2 scanner with EMI cameras this was then replaced with CMCR 9 a similar Type 2 but with PYE/Philips cameras. (This swap of CMCRs gave London an all EMI fleet and the regions all PYEs). CMCR9 survives to this day, following its transfer to Manchester. From the early 1980s Pebble Mill had several scanners (a BBC Term for an OB vehicle possibly dating back to World War II when it was an RAF term for mobile radar vehicles which the GPO and BBC used after the war). The OB Fleet was based at the rear of the building in its own garage space that was connected to the main complex by the ‘Link Spur’ that ran from the props store past security and mechanical workshop. There was an inspection pit and space to park two vehicles. There was plenty of space in front of the building to park the other OB units, ‘Links’ vehicles and camera van/cable tenders. CM1 was a Type 5 Scanner built by Link Electronics. This was a five-camera vehicle and had Philips LDK-5 or -6 cameras. CM1 would service big sports commitments and other large events around the Midland region such as the snooker at Sheffield, Grand Prix from Silverstone Race Track, Songs of Praise and many others and it was an integral part of the BBC’s nationwide TV OB fleet. Eventually CM1 was sold to ex-Pebble Mill OB crews who started Transvision Outside Broadcast. CM2 was a ‘Topical News & Drama’, two-camera vehicle equipped with Philips LDK-14 cameras connected to LDK-5 CCUs (Camera Control Unit) and based on a Dennis TK chassis. In 1982, Boys from the Blackstuff, an English Regions Drama production, was shot on CM2 in Liverpool. The director, Philip Saville, was breaking lots of conventions (not least shooting wide-angles and close-ups at the same time) and presented Ramon Bailey (Sound Supervisor) and his sound crew with lots of challenges. CM3 was a Single camera vehicle based on a Transit van and was similar to modern SNG vehicles. The TV OB Fleet was the first to succumb to the accountants’ spreadsheet logic, and its demise was the first tangible indicator of Pebble Mill’s televisual decline. The vehicles were sold off in 1992 despite being some of the most efficiently scheduled of the BBC’s entire OB Fleet. Pebble Mill had a BBC Type-B Vehicle mainly tackled live religious programmes such as Radio 3’s Choral Evensong, or Sunday Worship. A typical B-type, features a CALREC S-Series 40-channel sound desk with LS 5/8 speakers and nearfield monitoring. Birmingham’s Type B is still operational from the Mailbox. SCV6 is an articulated Sound Control Vehicle which handled Radio 1 and Radio 2 popular music OBs. Now as one of only two SCVs in the country it is used for live and recorded shows up and down the UK. The SCV is fitted with an ageing SSL 4000 console (with automation) and a Pyramix digital multitrack system. This vehicle still operates with Radio Outside Broadcast with its sister SCV5. The Type-C ‘ice-cream van’ would normally tackle Any Questions, sport OBs like Test Match Special, or athletics from Perry Bar. The centre was responsible for a large output into mainstream network radio and was also home of the local radio station Radio WM. WM had studios on the first floor linking the Comm’s centre and the news room. The two radio studios and Local Radio Operations Room overlooked the central courtyard and between them provided all of Radio WM’s production base for 35 years. In addition to WM the complex also had some of the finest sound studios outside of Broadcasting House in London. Studio 1 was the main music studio at Pebble Mill with enough space to accommodate a full symphony orchestra. Initially, it was used for sound recording sessions plus the twice weekly live broadcasts for Radio 3’s lunchtime concerts. However, as well as radio this studio was equipped with a basic lighting grid and was used in its early years for the occasional television programme. The studio lighting was controlled from gallery ‘C’ from the summer of 1983. However, John Birt’s ‘Producer Choice’ agenda in the early 1990s forced Pebble Mill to charge unrealistic rental rates for the studio and thus ensured that Studio 1 became too expensive for radio use. Therefore Radio 3 moved out to Adrian Boult Hall in the centre of the city, with the newly developed BBC Resources, turning Studio 1 into a full-time TV studio. A scene dock door was added together with the installation of a more comprehensive lighting grid. Soon after, Studio 1 was in daily use for the live transmission of The Really Useful Show. This lasted for three series, but it is understood that the long acoustic reverberation characteristics of the studio were not idea for TV sound. Programmes that originated from Studio 1 included Daily Live, Anything You Can Cook and Front Room. As mentioned above, in its final years Studio 1 was used as a sound stage for Doctors, although the associated radio cubicle continued to be used to produce Radio 4’s Farming Today until the closure of Pebble Mill as a whole (in May 2004). Studio 2 was a large popular music studio with an SSL 4000 console and a reverb time of about half a second. This is where aspiring music balancers were trained, but regrettably there will not be a music studio of any kind at Pebble Mill’s replacement facility, The Mailbox. Studio 2 in the 1990s was used mostly by Radio 2 as its midland sessions studio and many popular musicians performed there. Pebble Mill’s radio drama studio, Studio 3, provided much of Radio 3 and 4’s drama output – it was the home of The Archers, the world’s longest running radio soap. The last Archers programme from Pebble Mill was on 13 September 2004. The Mailbox (Pebble Mill’s replacement) has a smaller radio drama studio, but incorporating a larger dead-room with an anechoic ‘snail’ for long, outdoor approaches. The Archers transferred to the Mailbox studio at the beginning of October 2004 and the drama studio was designed by Mark Decker. The adjacent facility (M3 – Midland 3) was a small edit studio and had a SADiE and was primarily used for editing The Archers, Radio 2 specialist music shows, and Radio 4’s Midlands-based Features and Rural Affairs output. Studio 4 was the chassis of a studio that was never installed, but it had an edit suite associated with it called M4 (Midland 4) where most of the Radio Drama was edited. This is where the first AMS Audiofile DAW was used in radio and was then equipped with both Audiofile and SADiE in the mid-1990s. Studio 5 was the General Purpose studio – over the years it had done every form of feature or ‘strip’ programme, from Woman’s Hour to Radio 2’s Ed Stewart Show on Sunday afternoons. The studio was refurbished at least twice and was home to The Richard Bacon Show, live Saturday and Sunday nights on Radio 5. Radio 2’s specialist popular music such shows as The Best of Jazz, Paul Jones, and Stuart Maconie’s Critical List where recorded or transmitted from there as well. Studio 6 was not equipped until about 1995 but was where Radio 2 Through the Night originated – presented by Janice Long, Alex Lester and Mo Dutta. The Mailbox has facilities intended to replicate the functionality of Studios 5 and 6, as well as the M3 & M4 editing facilities. According to the floor plans of 1971 there was a seventh sound studio on the first floor adjoining the local radio studios. This studio was never commissioned and became an office and later became an electronics room for comms centre. The Mailbox has facilities intended to replicate the functionality of Studios 3, 5 and 6, as well as the M3 & M4 editing facilities. BBC Birmingham and BBC Midlands, from their initial conception, were to provide local interest and national programme output for the Midland Region. Over Pebble Mill’s 35 years of operation the studios produced some of the BBC’s most iconic programmes and was second to Television Centre for total output. The following is a small list of the total programme output of the complex. There were many single and short run documentaries, OBs and pilots which have come and gone over the years many of which will never be remembered. Pebble Mill housed Radio West Midlands (Radio Wm) but also produced programming for Radio 2, 3 and 4. Most of Radio 4’s 1990s dramas came from Pebble Mill. Radio programming included over the years Woman’s Hour, The Ed Stewart Show on Sunday afternoons. The Richard Bacon Show, live Saturday and Sunday nights on Radio 5. Radio 2’s specialist popular music shows as Best of Jazz, Paul Jones, and Stuart Maconie’s Critical List a Radio 2 Through the Night and radio shows presented by Janice Long, Alex Lester and Mo Dutta. The world’s longest running radio soap, The Archers was produced in Studio 3. Midlands Today the midlands region news programme, Inside Out, Points of View, The Chequered Flag about the history of Motor Sports. The John Gau Productions/CBS/TBS coproduction ‘Reaching For the Skies’ a documentary series on the history of aviation. Also in the 1990s a News department programme The Midlands at Westminster, a local politics strand broadcast at Sunday lunch time on BBC 2. Telly Addicts, Top Gear Motorsport, Noel’s Addicts, The Great Egg Race with Professor Heinz Wolff, A series of 2point4 Children, An Actors Life, The Golden Oldie Picture Show, May to December, Don’t Wait Up, Going for a Song (the 1990s version), Call My Bluff (1997-2005 revival), Eat your Words, Date with Fate, Blizzards Toys. A series of Can’t Cook Won’t Cook, A Song for Christmas, The Basil Brush Show (1970s version) and Best of Brass, a brass band competition. The Clothes Show, Gardeners World, local music programme ‘Look Hear’, On the House a series on DIY where an entire house was built from the foundations up and the work done inside the house presented by Harry Greene and Patty Coldwell. Countryfile, Farming, Kick Start, Junior Kick Start. Pebble Mill also developed lifestyle programming with Style Challenge and To Buy or Not to Buy. BBC Birmingham was also responsible for a popular BBC2 programme for much of the 1970s-1990s the Snooker programme Pot Black, which was generally shown most Fridays throughout the year at 9pm. Throughout its 35-year history Pebble Mill productions of BBC drama was quite extensive. Rose for Winter, Jane Eyre, Fosdyke Saga, Airbase, Tycoon, Bird of Prey, and A Very Peculiar Practice (first series). Owen MD, Lord Peter Wimsey played by Ian Carmichael, and Diary of a Madman. Episodes of Z-cars, The Moonstone, The Roses of Eyam, Prometheus, Sophia and Constance, The Battle of Waterloo starring Warren Clarke, Poldark, Martin Chuzzelwit, and Angels, Adaptations of Charles Dickens work, Shakespeare Plays, Dalziel and Pascoe, Vanity Fair (1987). A series of Pobol Y Cwm in the early 1970s, Doctors, Dangerfield, Trainer, Kinsey, Triangle, Doctor Who serial Horror of Fang Rock in 1977. All Creatures Great and Small, Howards’ Way, Juliet Bravo, This Life, The Brothers starring Jean Anderson, Spy Trap. Pebble Mill produced Specials a short series about a group of Special Police Officers in a fictional Midlands Town. and the anthology series The Afternoon Play. Rentaghost and one series of HartBeat with Tony Hart, SMart the replacement for Tony Hart’s children’s arts programme. The Adventure Game, Bodger and Badger. Also editions of Play School and Jackanory. During the early ’60s, BBC Birmingham pioneered television programmes for the Asian community. These were presented and produced by Mahendra Kaul and directed by Ashok Rampal, and broadcast on Sunday mornings. The programme, Apna Hi Ghar Samajhiye (“Make Yourself At Home”) aired on Sundays at 9am for half an hour and Empire Road (1978–79) was shown on BBC2. During the late ’70s and ’80s Network East (An Asian Unit Programme) was produced both in Studio A and B providing both music and interviews for the Asian community in the Midlands. BBC Birmingham utilised the main foyer of Pebble Mill for television entertainment and magazine programmes, mostly for BBC1. One fixture of the schedule, Pebble Mill at One became a popular British afternoon chat BBC1 show, though it started originally on BBC2. The idea to use the reception and foyer for programmes was borne out of the fact, all the other studio space was either fully used for Birmingham produced, or for BBC TV’s network needs for the various London based programme departments. 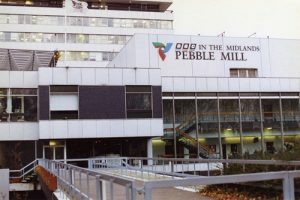 Pebble Mill at One ran from 1972 until 1986, was then one of few daytime magazine programmes, hence its popularity at the time. There was at least one Pebble Mill spin-off during the 1970s, when BBC1 rested its main Saturday chat show, Parkinson. BBC Birmingham was commissioned to produce a late night chat show. Saturday Night at the Mill, was the result and Kenny Ball and his Jazzmen were the regular house band, and they performed the show’s signature tune. The programme was directed and produced in Birmingham by Roy Norton and Roy Ronnie. In 1981 an early evening version of a hit show from the sixties on BBC1 called Six Five Special re-surfaced during the Mill’s summer break, presented by Donny MacLeod and Marian Foster. 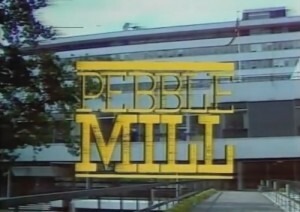 The Pebble Mill format returned in 1988 as Daytime Live, renamed Scene Today followed by Good Morning with Anne and Nick all broadcast from Studio C. And finally Pebble Mill a programme broadcast from Studio A presented by Alan Titchmarsh and Judi Spiers in a format similar to Pebble Mill at One. 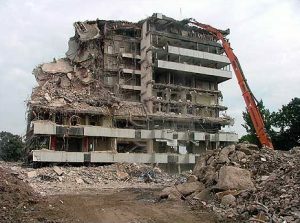 Problems with the lease and changes in the way television is produced, in addition to increasing repair costs due mainly to the building suffering concrete cancer led the BBC to vacate the premises and move to new studios at the Mailbox, completing the transfer on 22 October 2004 after just 33 years at Pebble Mill. Remaining fixtures, furniture and technical equipment were auctioned at Pebble Mill a few weeks later. The studios were demolished the following summer, with developers planning to develop a technology and science park on the site. However, as of 2012 development has yet to begin. The decision to relocate was controversial. Indeed, not long after the decision was made to move to the Mailbox, it was discovered that there was not sufficient strength in the foundations to construct the area of mezzanine floor as originally planned. Some departments had to be relocated to a second site (notably the drama department) which became known as the ‘Drama Village’.